Here at the National Trust, we "shore" love our lighthouses. They span from coast to coast and often pop up in the unlikeliest of places—including the most northwesterly point of the lower 48 United States, the bustling metropolis of Boston, and even one of the Great Lakes. 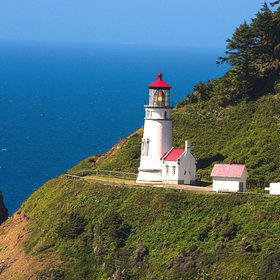 You can plan your next trip with your favorite maritime landmarks in mind, thanks to this handy guide featuring 14 of our favorite lighthouses in the U.S.
You can catch a glimpse of the Cape Flattery Lighthouse—one of our National Treasures—from the end of an isolated trail at the most northwesterly point of the lower 48 states, where the Makah people have lived for millennia. The lighthouse, first constructed in 1857 by the U.S. Lighthouse Service, is situated just three-quarters of a mile from the edge of Cape Flattery on remote Tatoosh Island in Washington State. 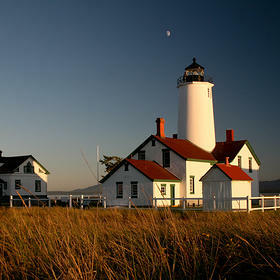 Punctuating the end of a five-mile ribbon of sand and driftwood at the entrance to Puget Sound, New Dungeness has served as an essential beacon for sea captains traversing the Strait of Juan de Fuca in Washington State for more than 150 years. 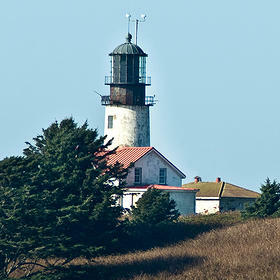 This historic lighthouse is maintained by volunteers, who stay for about a week at a time. A two-year restoration project brought this landmark lighthouse back to the way it looked when the light at the top of the 56-foot-tower was first lit in 1894 in Lane County, Oregon. And it remains just as impressive at its perch 205 feet above the ocean. 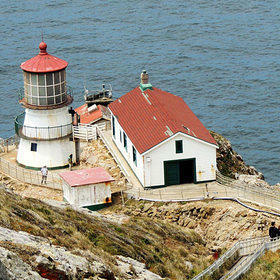 To help mariners navigate the tricky Point Reyes Headlands, the U.S. Lighthouse Service built this lighthouse in 1870 in Inverness, California. At sundown, the lightkeeper would light the oil lamp inside the first-order Fresnal lens, which would then be rotated by a brass clockwork mechanism, sending a beam of more than 1,000 prisms out to the sea. 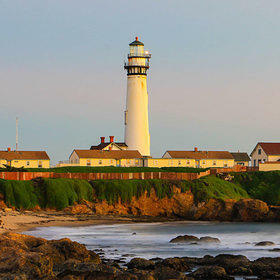 At 115 feet tall, Pigeon Point Lighthouse, now a part of Pigeon Point Light Station State Historic Park in California, is one of the tallest lighthouses in the United States. Although the tower has been closed since 2001, its 2,000-pound Fresnel lens is still on display on-site at the fog signal building, and visitors can take guided history tours around the lighthouse grounds from Thursday through Monday. 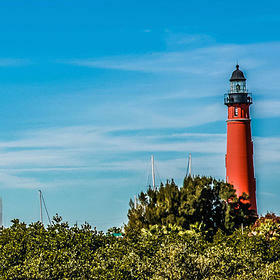 At 175 feet tall, Ponce de Leon Inlet Light Station is Florida’s tallest lighthouse. It was completed in 1887, and when the kerosene lamp in the first-order fixed Fresnel lens was lit, it could be seen nearly 20 miles offshore. Once a month, during the full moon, the Ponce de Leon Lighthouse Preservation Association hosts special evening tours of the site. 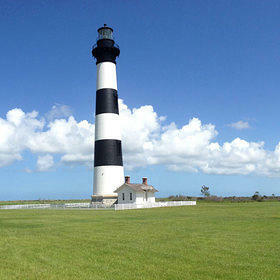 Visitors to Bodie Island Light Station in Nags Head, North Carolina, can now climb all 214 spiraling steps to the top of the 156-foot-tall lighthouse. The reward is stunning views of Pamlico Sound and the Atlantic Ocean. 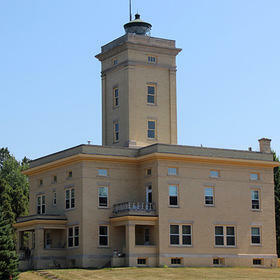 Don’t miss the original lightkeeper’s home, which is now a ranger station and visitor center. 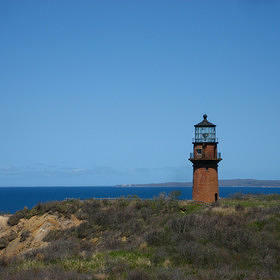 The Cape Henry Lighthouse, ca. 1792, silently guards the entry way into the Chesapeake Bay. Standing near the "First Landing" site of the Jamestown, Virginia settlers where in 1607, Captain Newport raised a cross to offer thanks for their safe crossing of the Atlantic, the Lighthouse has stood sentinel since it was completed in 1792. Gay Head Lighthouse in Aquinnah, Massachusetts was the first lighthouse built on Martha’s Vineyard and one of the first in the U.S. to receive a first order Fresnel lens in 1856. 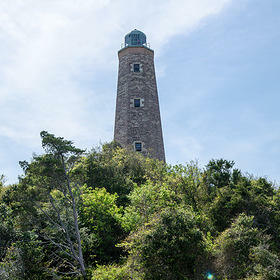 Standing atop the National Natural Landmark Gay Head Cliffs, the lighthouse serves as a beacon to Wampanoag tribal heritage and is the only lighthouse with a history of Native American Lighthouse keepers. 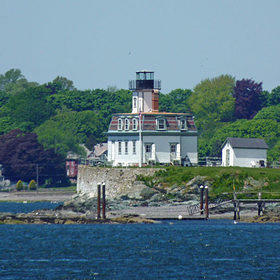 On an 18.5-acre island off the coast of Rhode Island, a mile into Narragansett Bay, there sits the Rose Island Lighthouse. The wood-framed structure was built in 1869 and for a hundred years, its keepers battled extreme weather and isolated island conditions. Today, the lighthouse is reachable only by boat. You can stay there overnight or take the Jamestown Newport Ferry out to Rose Island for the day to tour the lighthouse and museum. A candlelit pillar that guided tempest-tossed mariners to safety, Colonial America’s first lighthouse was so far ahead of its time that nearly 50 years passed before another was constructed in the United States. 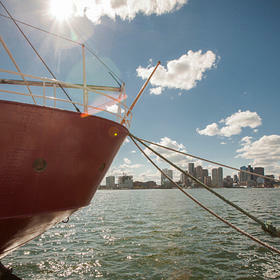 Three centuries later, the blinking eye of Boston Light—the only remaining U.S. Coast Guard beacon with a resident keeper—still shepherds sailors through the city’s island-studded harbor. Essentially a floating lighthouse, Nantucket Lightship/LV-112—one of our National Treasures—guided countless vessels through the dangerous, often fogbound waters off the Massachusetts coast. Constructed in 1936 and designated a National Historic Landmark in 1989, Nantucket Lightship/LV-112 was called the "Statue of Liberty of the Sea,” as it was the first and last U.S. landmark seen by ships traveling to and from Europe. Halfway Rock Lighthouse is so difficult to access that it was deemed a “stag lighthouse” at the peak of its service—for their safety, lightkeepers’ families were strictly forbidden. 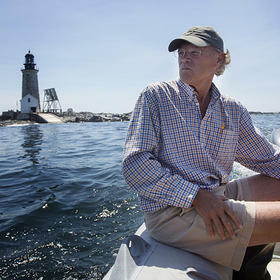 But its remote Casco Bay, Maine, location and deterioration after more than 40 years of deferred maintenance did not stop the restoration of this 146-year-old granite beacon. Sand Hills Light overlooks Lake Superior on the Keweenaw Peninsula of the Upper Peninsula in Michigan. 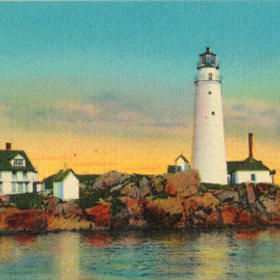 Completed in 1919, the lighthouse was reopened as Sand Hills Lighthouse Inn, an eight-room, Victorian-style bed and breakfast.